May 2015 - Author of "Eurasian"
Brookline Asian American Family Network (BAAFN) was formed to support the needs of Asian/Asian American students and their families in the Brookline school system. ​ The Steering Committee is seeking submissions for its 2019 Asian American Essay Contest. Only one essay submission per person. Entry submissions must be original content. What It Means to be an Asian American? Your experience arriving in a new country and growing up in America. Challenges that you have encountered and had to overcome or positive experiences you have had.. Individuals in actual situations should not be identifiable. The maximum length of the essay is 750 words. Submissions not meeting the expressed specifications will not be eligible for the contest. 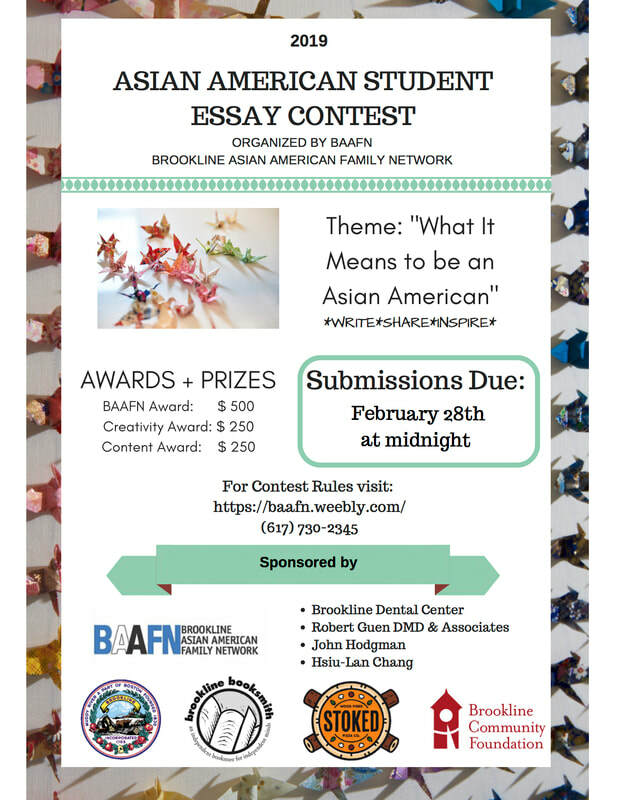 Please note that submissions will become the property of the Brookline Asian American Family Network for use in future activities as appropriate to promote diversity. Winning entries are selected based on creativity, originality and skill in the category. Prizes will be announced by early April and winners will be recognized at an awards ceremony in May.